“Blackheads, Blackheads everywhere, not a place to hide”. A few months back I was looking through the magnifying mirror then I literally noticed blackheads all over my face and believe me the first line that I wrote was hanging in mind like a broken recorder. Many people are an active sufferer of this major thing. Whenever you are applying any makeup or skin care product, you sometimes feel that that is not suiting your skin type but what I think is that the blackhead clogged your pores so badly that your skin don’t get a chance to absorb the product which are applied. Taking out blackhead is quite a hectic job for me at first but after trying out some straightforward and easy to go method it’s more controllable now. Blackheads are nothing but a variety of acne. When you skin pores is open; dirt, sebum, excess oil, dead skin cells or other clogged your open pores and the clogged things get oxidized and ultimately form the color black or deep brown. As there is no skin over it those things oxidizes very rapidly. This ultimately calls blackheads. If you don’t take proper step against blackheads then it may lead to further acne related issues. We know that prevention is better than cure. So if you know the risk factor for blackheads than you can secure yourself from blackheads. But I think, as you are reading this article so definitely you have blackhead problem. But you can share this tips to your friends so he or she can save themselves from blackheads. Risk factors of blackheads are very much similar to pimples. Over production of oil is the main cause of pimples as well as blackheads. Though during the time of puberty there is a huge production of oil due to hormonal reason. This is not the only reason there’s load more other factors which increases the production of oil.Oily food can increase the chance of oil production and it can directly harm those areas which have oil producing glands. There is more chance to produce blackheads if you have Dirty skin. So wash your face at least two times in a day with a good cleanser. Try to use a reputed brand product and obviously choose the products which suit your skin. You already know that, there is no skin over the blackheads so you shouldn’t exposed those in a dirty environment. Use a scruff, umbrella and sun glass whenever you go to outside. You can notice blackheads if propionic bacterium attacked your skin. This bacteria resides on the oil that is produced in your skin. Let’s come to the important part, how to get rid of this stubborn problem. Solution of blackhead is not that easy to overcome. 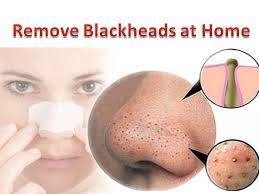 It’s need a bit of a time to cure your blackhead problem but I prefer to use home remedies first as it carries no side effects. I will also talk about the medicated or blackhead related products which can also be used if you are not benefited by natural remedies. My first recommendation will be the cotton ball process. I have personally used this process several times. Firstly, Take a mild ex-foliate and use it to remove dead skin cells which are exposed. Then pat your face with a clean towel. Give a slightly hot compress over the blackheads. The duration of compress should not be more than 15 minutes. This warm compress makes the skin soft and widens the pores of blackheads. Now pat your face again by a clean soft towel. Take some cotton ball and place this on your finger tips and gently apply equal pressure on both sides of the blackheads by pushing up and down. By doing so, your blackheads will come automatically. There are some blackhead removal tools which can also be used but those are a bit harsh for me. You may think it’s fanatical. But after using this method, definitely you will change your opinion. Purchase a tube of non toxic glue such as P.V.A glue or Elmer’s glue. Actually this glue is used in school for art project. Anyway, first of all wash you face by a good cleanser or face wash.
Now apply a slightly warm towel on the blackheads. Now pat your face and apply little amount of glue on the blackheads. Allow the glue for drying. After it’s dry, peel it off. Now you can see the magic of glue. You can also use charcoal powder which are available in many a more store. The method is almost same. In a bowl take a good amount of Non toxic glue add with it some charcoal powder. Mix it well and then apply it on the area where you are experiencing blackheads. Try to avoid those areas which have hair. After the mixture is dry peel it off. You will obviously notice that the dry agent is carrying loads of blackheads and white heads. It’s another method which can give a good result. Take a clean and sterile toothbrush and take little amount of toothpaste on it. Wet the area of blackheads. Now gently scrub on the blackheads by the toothbrush. Apply this method once daily until you get the result. One thing you should keep in minds that sterilize the toothbrush each time after using this method. People who have sensitive skin should keep in mind that before using this method they needed to use it in one particular area so that they can see either it’s exasperating them or not. Lime juice can also discolor the spot on your face. Simply you need to make a solution by mixing equal amount of lemon juice; glycerin and almond oil. You can exempt the almond oil from your list. Now gently apply this solution on your skin at night time. In the morning wash it off with normal tap water. Lime or lemon juice helps to fight against the bacteria. Use this solution each day for about 10 days and obviously you will notice the difference. Direct application of lemon or lime can create nuisance that’s y we are suggesting this simple solution. Take a tea spoon of Honey. Now apply on the blackheads. Wait for 15-20 minute. After that, wash your face by water and you will notice that your skin is glowing. Baking Soda is not only effective for baking or cooking purpose, it also holds so many other benefits. Take some baking soda and add with it few drops of water to make a past. Apply the mixture on the area where you are noticing blackheads. After 10 minutes, wash it off with cold water. Baking soda helps to dry out the blackheads and tends to lighten it up. Must use moisturizer after using baking soda as it tends to dry out skin. This is a quite disgusting solution for some people. But there is no doubt about the working capacity of Egg white. My little sister always prefers this method. First of all, take an egg and separate the egg white from it. But do not take the egg yolk because it has no effect on blackheads. Now apply the egg whites on your face. paper will get stiff to the place when it is dry. Peel of the paper by one attempt. Now wash your face with warm water and clean it properly. Now apply an oil free moisturizer on your face. If you have a dry skin then you can also use oily moisturizer too. You will obviously notice black dots on the tissue paper. Your blackheads can come off that easily. There is a cream containing alpha hydroxyl acid. This cream is very useful for blackheads. Apply small amount of cream over the blackheads. This cream has a strong capability of opening the pores of blackheads and cleaning the dead skin. If your skin is sensitive than don’t use this cream. Also don’t go outside after application of this cream. Choose product which are using natural Calcium Bentonite. There are many brands carrying this substance. What it does is that bentonite fight against the dirt, clogged pores or oil or sebum. Take 1 tsp of clay mask and mix with it 1 tbsp of ACV. You can use water instead of ACV. Apply it all over the face and after 30 minutes rinse it off. Clay mask is one major factor to reduce blackheads. I got my result within 1 month after using. Chemical exfoliates helps in a many a more ways. Chemical exfoliates are included in my daily routine. Sometimes we don’t get a chance to try home remedies in that case we can use the chemical exfoliates. As we are talking about blackheads then I prefer to use beta hydroxy acid (BHA). It helps to reduce inflammation, wrinkles and glow your skin tone. BHA helps to clear out your skin impurities and helps to balance your pH level of skin. BHA helps to penetrate your skin and gives a smooth effect. These are some remedies which I tested myself. You can use any of those and give it a try. Thanks a bunch for reading it out and share your thoughts through comments.